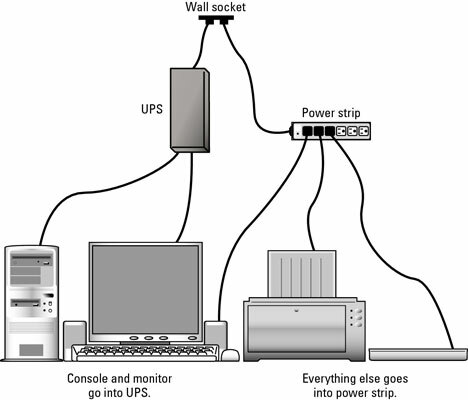 UPS stands for uninterruptible power supply, and a UPS is the best thing to use for hooking up your computer system to the wall socket. Basically, a UPS is a power strip combined with a battery. It can keep your computer running when the power goes out. The notion behind a UPS is not to keep computing while the power is out. Instead, the UPS is designed to keep your basic computer components — the console and monitor — up and running just long enough for you to save your work and properly shut down the computer. That way, you never lose anything because of a power outage. Leave the UPS on all the time. You need to turn it off only after the power goes out and the computer has been properly shut down.